Others on this board deserve praise for topical postings, adding to a thread as they find more items on the focus topic, and open to corrections, comments, and more links. Because I have been driving through Yonkers weekly recently, and with little time to ride buses or explore, I would like to work on the predecessors to Westchester Bee-Line routes through the city of Yonkers, New York, without ignoring the present routes. As others have done, I will link to buses.nycsubway.org and other sites, without embedding the photos. If you open the link in a separate tab or window. you do not lose the thread. To start, here is Club Transportation 483 on Route 25 starting from Yonkers Railroad Station, headed to East 238th Street (Nereid Avenue), Wakefield. Visiting Cross-County Shopping Center on route, it runs about 3x an hour Monday-Saturday and 2x an hour on Sundays. I think is the same route route as Club Transportation 25. The route may be more than 80 years old! 1) The successor to the nine streetcar routes of the Yonkers Railroad, the T.A.R.S. subsidiary. They were not taken over by another T.A.R.S. subsidiary, Westchester Street Transportation Company, but ran for more than ten years either as independent and struggling Yonkers Railroad (Macks) or Yonkers Transit (the same and newer Macks). 2) Club Transportation, as in the previous post, with Route 25 from Yonkers to Wakefield and Route 20 from The Bronx to White Plains, along Central Park Avenue. 3) Whatever firm owned the Nodine Hill bus route, now covered by Bee-Line 32. 4) Whatever firm ran from Getty Square through the wealthier heights of North Broadway, maybe all the way to Hastings. Bee-Line Route 6 now does North Broadway on its long run to White Plains and Pleasantville. 5) Maybe Riverdale Transit ran a Yonkers to Midtown route similar to the present BxM3. Which company first established the garage at 59 Babcock Place, west of Warburton Avenue? 6) Addition as of 5.4.2014: Yonkers Bus Inc, probably Bee-Line route 30. See post below. Is the Liberty Lines garage at 475 Saw Mill River Road on the property of a previous transit bus operator? The BusTalk gallery pages on Yonkers Transit and Liberty Lines answer several questions. Yonkers Railroad streetcar 9 went uphill from the Foot of Main Street to Elm and Walnut on Nodine Hill, a short but steep run. From this photo of the 9 North Yonkers sign, it would seem that Yonkers Transit yielded Nodine Hill to the Nodine Hill buses (a separate carrier, which toured the Hill more completely than the streetcar). Yonkers Transit changed route 9, making it go north from Getty Square rather than east. 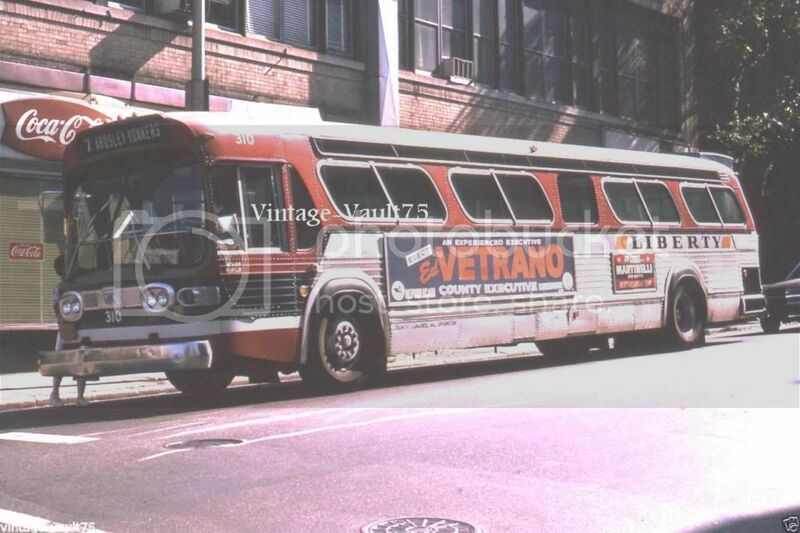 Here is a later photo with Liberty Lines 404 displaying the "9 North Yonkers" sign. Bee-Line "9 North Yonkers" is interesting. Northbound, it runs atop the ridge of Park Avenue, Palisade Avenue, and North Broadway, reaching Executive Blvd, the area of office buildings, a Marriott, and a Hampton Inn. It returns south using the valley parallel to the east, namely Nepperhan Avenue. Service on "9 North Yonkers" is skimpy, maybe because routes 2 and 5 provide more frequent service along the ridge (route 2) and the valley (route 5). Location: Broadway, just north of West 242nd Street. In the late 1930's, the Third Avenue Railway System painted or hung large route designation signs on their streetcars. In the 1940's, just as today, Yonkers routes 1, 2, and 3 began here on their trip north. All routes go directly to Getty Square. Nowadays, Westchester Bee-Line 1C extends far north to the Westchester Medical Center in Valhalla, making it a long one-fare ride from any starting point on the NY subway system. Each variation of Route 1 uses Warburton Avenue from Main Street Yonkers to Hastings. Base service on Route 2, with good frequency, reaches Tudor Woods, a handy traffic circle just a few blocks north of Roberts Avenue, where the streetcar motorman changed poles and reversed the seats. Streetcar route 3 was a tripper that turned back at Getty Square, but now the bus serves White Plains and Purchase. Very interesting thread to which I will be happy to contribute to starting now! Seen sometime in 1973 on Riverdale Avenue in Yonkers and signed for the #7 Ardsley/Yonkers Line is fleet # 310 - a 1970 53 passenger GM Coach modeled as a T8H-5306A and one of 27 likenesses numbered 300 to 326 purchased by the County of Westchester and delivered to Liberty Coaches, Inc. of Yonkers, New York in August of that year. Note that Club Transportation directly purchased five of the same model two months earlier and were #'d 463 to 467. Photo courtesy of 'Vintage-Vault75' and is available at eBay as item # 181342133422. Information abstracted from Ohio records. Many thanks for this and the multitude of informative posts that you have made on BusTalk. As I go through the collections of Yonkers bus photos on the internet, I will have to keep in mind this particular set of GM's from the early 1970's when the county was buying for the privates. I admire the management of Westchester Bee-Line for the way it seeks customers in some remote places. The New York State Thruway between Tuckahoe Road, Yonkers, and Ardsley is flanked by ridges that recently became new commercial centers. Yesterday, I found people waiting along Stew Leonard's Drive (a huge supermarket, a Costco, and a Home Depot) for a Route 78 bus, which, in Y shape, visits the ridge to the west of the Thruway and then visits the east ridge (Ridge Hill) before returning to downtown Yonkers. Maybe half the passengers are employees of the big stores that have big parking lots or garages, a two-mile walk from Tuckahoe Road. Many thanks to Mr. Linsky for posting a 1932 SOCONY ad that addresses the lubricating oils used on Yonkers Bus Inc. between Getty Square and Bryn Mawr station of the Put, adjacent to Palmer Road east of Mile Square Road. Therefore, I have the name of yet another old bus company, and the vestiges of this route seem to be the Bee-Line Route 30 from Getty Square via Lockwood Avenue and Palmer Road to Bronxville and on to New Rochelle. The search engine on fultonhistory.com has proven a boon for news articles from the Yonkers Herald-Statesman. In this instance, an article in the Herald-Statesman of 12.24.1959 explains the PUC approval of the purchase of Yonkers Railroad Co. by Yonkers Transit Corp. Samuel S. Schreiber was president of both companies. I don't know whether he owned other companies. I have not yet researched the history of Yonkers Railroad, but I am quite certain that, when I rode all its nine routes in the late 1940's, the paper transfers were marked Yonkers Railroad, one of several subsidiaries of the bankrupt Third Avenue Railway System. At least this article gives a date, the end of 1959. I do recall the Macks marked Yonkers Railroad and later Yonkers Transit, but I did not remember the date of change. For about seven years the buses carried the name Yonkers Railroad. Thanks to a new poster on the "Information" thread, I was led to the identification of the operator of the Nodine Hill bus, namely MID-CITY COACHES, maybe years 1952-1974. An article in the Herald Statesman of September 11, 1963, announces improvements in Nodine Hill service. The company will continue to meet all morning and evening commuter trains at two stations, Yonkers and Ludlow. There will be three routes: 1. Park Hill. 2, Nodine Hill. 3. Genung Shuttle. Mid-City Coaches is owned by Henry Malanowski, with the help of his son. Routes 1 and 2, according to the article, describe which hill the bus will climb first. I suspect that means 1) counter-clockwise, and 2) clockwise. The Genung Shuttle service runs 3 p.m. to 6 p.m., first visiting southwest Yonkers, then hitting the two hills before returning to Genung's Department store on Getty Square. Wasn't Mid-City the company whose fleet even in later years still consisted mainly or entirely of Beavers? Or perhaps I am thinking of another operator. 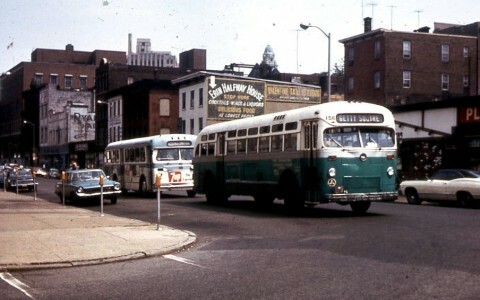 I'm not good at identifying bus models, but someone on another thread here pointed to smaller Fords used on Nodine Hill. Beaver was a bus manufacture that went out of bankrupt around 1956, but many companies that had brought their buses ran them into the late 60's and early 70's. Many thanks, S-60, for giving me the lead about Beavers. Below is a photo in the Bus Talk Gallery. Behind Yonkers Transit 156 is what appears to me a Nodine Hill bus. Could somebody tell me what manufacturer or model it is? I think both buses have already passed Getty Square and they are on Main Street heading towards the Hudson River and the Railroad Station. City Hall tower in the distance and the building and chimney to the left of City Hall are the clues. I;m not 100% sure, so someone correct me if I'm wrong, but I think that it might be a Beaver. Thanks to c1cmc on another thread, I have learned the spelling of BERNACCHIA BROTHERS BUS COMPANY, which offered summertime trips from Yonkers to Playland, Rye. The July 13, 1945, Herald Statesman ran a display ad, "Now, Daily Bus Service to Playland. Buses leave daily and Sunday at 9 a.m. and every hour on the hour thereafter from Hudson Street and South Broadway. Phone YOnkers 5-1279. The Liberty Lines website gives 1953 as a foundation date of Bernacchia Brothers buses, but that name shows up as a bus operator in the 1930's. I am still uncertain of the o or a spelling (fifth letter) in the 1945 display ad.